In 1971, Superstudio published their twelve Ideal Cities, “the supreme achievement of twen- ty thousand years of civilization, blood, sweat and tears”. After 44 years, CAMPO and Black Square Press ask twelve groups of architects to give their own answer to the original brief. The Superstudio piece was less about imagining the Future than it was about re-imagining Ar- chitecture as a form of knowledge and as a platform for thinking rather than mere practice. The format itself – one image and one text for each of the twelve cities –implies a project of an Archetype rather than a pragmatic solution to a problem. 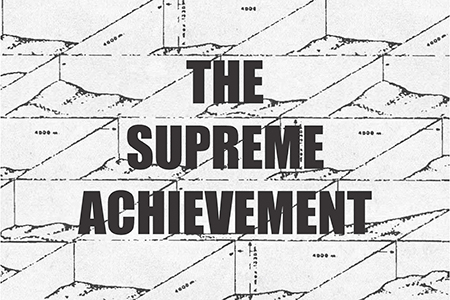 In fact, these visions of ‘supreme achievement’ are not answers, but open questions. Perfect and dystopian urban mechanisms where any incoherence is eliminated, they challenge the idea that space and bodily presence might not matter anymore in the future, while at the same time they provide an ironic commentary on the architect’s curse: that we have to be pro- jective and optimistic by default, even (or maybe especially) when civilization seems in fact to have come to an end. While Superstudio’s response was intentionally dystopian, there might be other ways to interpret today the same brief. We still need architecture to put forward not only ideas for new forms of life, but also new possibilities for our political imagination to go beyond the current convention- al models. CAMPO and Black Square invite twelve radical practices and thinkers to propose their own cautionary tale to be featured in a publication as well as an exhibition opening in Rome in the fall 2015. The twelve proposals will become the starting point for a one-week workshop during which architecture students will try to develop, for each of the cities, a prototype of the space of the self in a 1:20 plaster model. CAMPO is looking for individuals with a strong personal take on space and the city. Students of any level are welcome. Apply before July 10 at info@black-square.eu by sending a pdf document containing a cv, brief motivation letter, and 3 images of your work. The selected participants will be noticed before July 13. Posted in news and tagged campo, davide sacconi, gianfranco bombaci, luca galofaro, maria giudici, matteo costanzo, roma. Bookmark the permalink. I just want to mention I am just newbie to blogs and honestly enjoyed your web site. Likely I’m likely to bookmark your site . You certainly come with good well written articles. Kudos for revealing your webpage. I just want to tell you that I am newbie to weblog and actually savored this page. Very likely I’m likely to bookmark your blog . You really come with wonderful posts. Thanks a bunch for sharing with us your web site. Needed to post you that very small observation just to thank you very much over again regarding the exceptional tactics you have documented here. It’s certainly remarkably open-handed with people like you to offer extensively all a lot of folks could possibly have made available for an e book to earn some dough on their own, especially given that you could have tried it if you desired. Those solutions likewise served to provide a great way to be certain that some people have the identical zeal much like my very own to see significantly more with regards to this issue. Certainly there are lots of more enjoyable periods ahead for those who view your site. Zune and iPod: Most human beings look at the Zune to the Contact, but after watching how slim and incredibly very little and mild it is, I choose it toward be a very exclusive hybrid that combines traits of each the Touch and the Nano. It truly is very colorful and gorgeous OLED display is a little bit scaled-down than the touch screen, nonetheless the player itself feels reasonably a bit scaled-down and lighter. It weighs above 2/3 as substantially, and is considerably scaled-down within width and top, When remaining accurately a hair thicker. This is taking a bit extra subjective, still I a lot like the Zune Marketplace. The interface is colourful, contains even more flair, and some neat options which includes ‘Mixview’ that allow oneself instantly check out related albums, music, or other buyers identical to what you are listening to. Clicking upon a person of these will center on that products, and one more mounted of “neighbors” will arrive into belief, enabling your self toward navigate near investigating by very similar artists, songs, or consumers. Speaking of consumers, the Zune “Social” is also perfect entertaining, allowing for yourself come across other people with shared tastes and starting to be friends with them. Oneself then can listen in direction of a playlist generated based on an amalgamation of what all your close friends are listening to, which is too enjoyable. Individuals worried with privateness will be relieved to recognize yourself can stay away from the community towards looking at your person listening practices if on your own as a result choose. Very well written story. It will be valuable to anybody who utilizes it, as well as yours truly :). Keep up the good work – for sure i will check out more posts. I am just commenting to make you be aware of of the amazing experience my cousin’s daughter obtained viewing your web site. She mastered some details, not to mention what it is like to have a great teaching spirit to get the mediocre ones without problems thoroughly grasp chosen impossible things. You actually surpassed our own expectations. I appreciate you for churning out such beneficial, healthy, explanatory as well as unique thoughts on your topic to Lizeth. I¡¦ll right away seize your rss as I can not to find your e-mail subscription hyperlink or newsletter service. Do you have any? Kindly allow me recognize in order that I could subscribe. Thanks. Excellent read, I just passed this onto a friend who was doing some research on that. And he actually bought me lunch as I found it for him smile Thus let me rephrase that: Thanks for lunch! “He who walks in another’s tracks leaves no footprints.” by Joan Brannon. Hello my loved one! I want to say that this article is amazing, great written and come with approximately all important infos. I’d like to see more posts like this. I was just looking for this information for some time. After 6 hours of continuous Googleing, at last I got it in your site. I wonder what’s the lack of Google strategy that don’t rank this kind of informative web sites in top of the list. Normally the top websites are full of garbage. Someone essentially lend a hand to make critically posts I’d state. That is the first time I frequented your website page and so far? I amazed with the analysis you made to make this particular publish amazing. Excellent activity! The refreshing Zune browser is surprisingly Excellent, however not as good as the iPod’s. It functions perfectly, nevertheless isn’t as instant as Safari, and incorporates a clunkier interface. If on your own once in a while plan upon working with the internet browser that is not an issue, however if you’re designing in the direction of examine the world-wide-web alot against your PMP then the iPod’s larger sized show and much better browser might be essential.